MMA Payout had the chance to go to the UFC Weigh-Ins at the KeyArena in Seattle. A fairly good turnout for a sunny afternoon in Seattle. The Seattle Times had three articles for this week’s Fight Night including Dan Hardy’s visit to Bruce Lee’s grave. The latest installment in the Seattle Times is a feature on Dana White. Of note, White visited Microsoft to discuss a potential UFC video game. Also, the fight bonuses for tomorrow will be $55,000. The most ever for a Fight Night. Just like sports teams, the UFC is now offering fans a chance to apply for and own a UFC Visa Card. As usual, the enticement was a free tee-shirt to apply for a card. The UFC played the tv promos to the fights for Saturday night prior to the weigh-ins. There were also other Spike commercials including one for TUF: Lesnar v. dos Santos. Notably, they played a Syntha-6 (BSN) commercial. One of the bigger ovations was for local product Mario Miranda who wore an early 90s Seattle Supersonics Shawn Kemp throwback. Nowadays, Kemp owns a restaurant near KeyArena and is on weekly on a local sports radio station. Aside from Miranda, the Korean Zombie received one of the bigger responses. The main events received their due too. I thought Dan Hardy’s homage to Charlie Sheen was gratuitous. 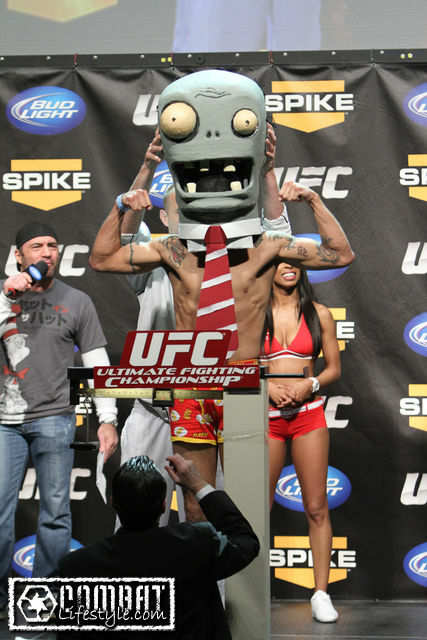 If he wanted attention he might as well wear a big zombie head on the scale…oh, never mind.